KANSAS CITY, Mo. 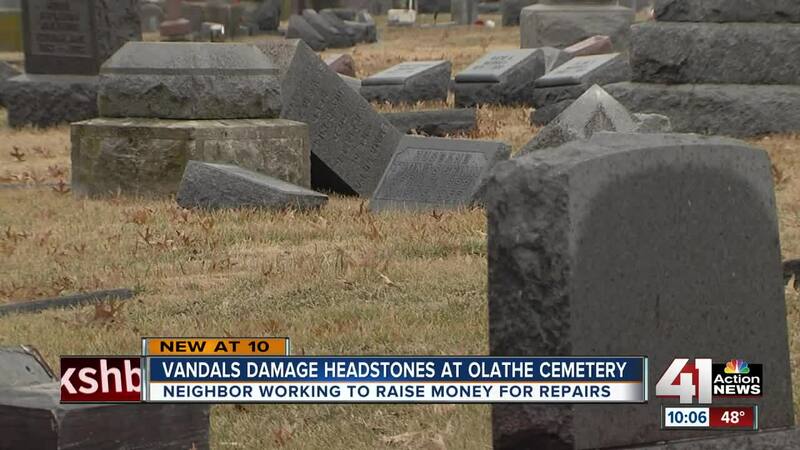 — UPDATE 4:50 PM 12/28/2018: Olathe police say a suspect has been identified and contacted after dozens of headstones at a local cemetery were found vandalized. At least 20 headstones were toppled over at the Olathe Memorial Cemetery, near Northgate and Herald Street. Olathe police offered a $1,500 reward for information that leads to the arrest and conviction of the people responsible. Anyone with any information is encouraged to call the Olathe Police Department at 913-971-6950 or the TIPS Hotline at 816-474-8477. The vandalism happened sometime between Christmas Eve and Christmas Day, according to a spokesperson with the city Parks and Recreations Department. It's unclear how the vandal or vandals got into the cemetery, as the gates are closed and locked at dusk. The city will take photographs of the damaged headstones to determine what needs to be replaced or repaired. The cost still remains unknown. Kristen McCullough lives by the cemetery. Since the damage, she has started a GoFundMe to help pay for the repairs. "I know people who are buried here," said McCullough. "It's devastating, I mean this is supposed to be your final resting place and you think no one is going to come and disturb you."